It's hot. Summertime hot. I don't think it's permanent, seems like it's going to cool down here at the end of the week, but for now, I'm enjoying every sunny minute of it. It also makes me want a new hat. You know, to keep the sun out of my eyes. Come on, it makes perfect sense. Eugenia Kim, as usual, has a few options that caught my eye immediately. But so does Club Monaco. I don't know why I'm surprised by this, but I am. oh, i love hats! especially for summer. all of the above are super cute! loving the black eugenia kim! 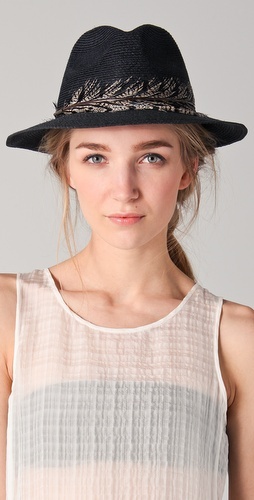 Even Allsaints Spitalfields, everyone's (especially my) favorite recherché steampunk brand has a straw fedora for sale this summer. But it's 40 pounds. When you're back in the US, you have to check out Madewell. It's my new favorite clothing line for simple, chic, modern and somewhat European looks. I don't think there is one in Madison yet, but I haven't been back in 9 months, so I could be wrong. I love Madewell too, though it's usually more the lookbooks that get me than the actual items. Same thing happens to me with J Crew, the styling is so amazing it makes me think I actually need what they're selling! I'll definitely take a look at their hats though, thanks for the tip! You're from Madison? Great to see you around the blog! D, I'm an old friend of yours in real life! Sorry, I realized that may not be obvious from my blogger identity! My parents are friends with your mom, they have a poodle (Ivy), I was a year ahead of you in school, now I'm an English professor; I think you know who I am now! I love your blog, it's delightful. You have an excellent sense of style. Ha! Well yes, I DO know who you are, despite all your attempts to keep your blogosphere identity secret ;) I peeked over at The Freudian Petticoat but didn't know for sure if it was you or not. Good to see you out here in cyberspace! And I'm glad to hear you like my blog, stop by whenever you like! You headed home for the summer at all this year?